SEO guru Stephan Spencer contributed a great overview on tagging and its virtues for usability and SEO to Search Engine Land last week. Do check out Stephan’s entire article if you’re new to the concept of tagging, tag clouds and folksonomy. Tags help describe various content. Basically, you can tag a blog post, product or photo with relevant keywords. When you want to check out all the posts, photos or products related to a certain keyword, you can click on the “tag” and voila! Usability-wise, visitors can navigate visually through a “tag cloud” (see the bottom of our page for an example) and even discover tags, whereas in a traditional dropdown menu or even faceted navigation this could get out of hand. Tags are great for SEO too, because your tags generate their own URLs, and each tag is a keyword-rich internal link to that page, reinforced by the tagged items themselves and the sitewide tag cloud, if you have one. 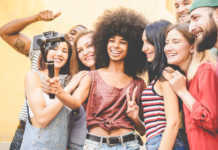 I took a peek at blogs from our list of 75+ blogs from top online retailers to “look who’s tagging” and as I expected, I can easily count them all on one hand. What’s worse, the ones that do are doing it WRONG! For example, let’s look at the Figleaves Blog. Figleaves’ blog uses a tag cloud, but uses such non-descript tags like “In the US Press” and “New York” for the post below. Really, it could go further tagging a post like this with more search-specific keywords like Skinsations, moisturizer, Cuddl Duds, loungewear and dry skin. As an ecommerce blogger, when you see a good opportunity to rank for a brand or long-tail keyword term, it could take only two or three posts tagged with that keyword to get a decent category page that can outrank product pages of other sites (especially when you’re writing unique content). 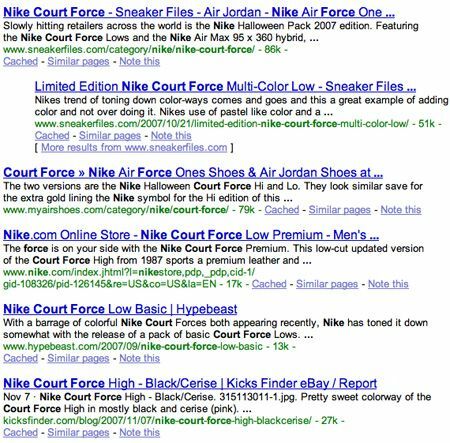 Note the search results above Nike.com have “category” in the URL, meaning they were tagged with the more specific keyword “court force.” One even gets the indented result with the category and a blog post entry. 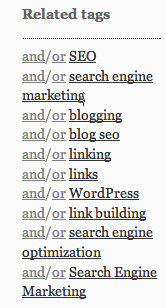 I did a quick search on a number of these terms and the blog appears page one or very top of page two. Now they’re getting some extra link love from Get Elastic, which might move their listings North some more. If FilthyDripped adds another post to beef up their archive showing customers wearing the shades or “New Shipment of Kanye Glasses – Shutter Shades in Stock Now!” they could rank even better. To really capture the long tail, Stephan explains the concept of “tag conjunction pages.” Because the nature of the long tail is that searches are infrequent but very specific (and closer to conversion), predicting every long tail query and optimizing accordingly is neither convenient nor practical. When there are a multiple posts with two tags in common (for example, “pink” and “iPod accessories”), new URLs are created for Googlebot to gobble up. By displaying a sidebar box with possible conjunctions, spiders can follow these links and index them. Amazon has used folksonomy (community tagging) for a while. You can even subscribe to product tags through RSS feeds – how Web 2.0 is that? (Check out the tag cloud here). Allowing your visitors to create the taxonomy of content items on your site by tagging your content … may or may not be a good thing. It depends on how good of a job your visitors will do and how good your quality control systems are at stamping out spam and minimizing noise. Amazon.com’s tagging system has been plagued with useless tags like “betty’s birthday,” which really only has value for the tagger and no one else. Nonetheless, tagging seems to be working for Amazon; if it wasn’t, they would cease expanding upon their tagging functionality and probably discontinue offering it altogether. Another issue with letting visitors do the tagging is lack of consistency. Sometimes visitors will misspell words, sometimes they will add hyphenation, sometimes they will use obscure synonyms. Which brings me to another point: your visitors don’t know how to (and don’t care to) conduct keyword research — identifying popularity of various keywords by search engine users. They may, for instance, tag a product with “hard disk” when “hard drive” is the much more popular keyword with searchers. But what do you expect? After all, you’re getting free labor! Tagging has a lot of value for SEO and usability. As webmasters and customers learn more about tagging we could see this becoming more mainstream. But for now, if you want to take advantage of tagging as an ecommerce blogger, there’s very few who are doing this well which means more opportunities for you to excel. Big thanks to Avi Alkalay for sharing his tag icon under Creative Commons.